Brighton Dome & Brighton Festival was delighted to receive the Employer Contribution Award at City College Brighton and Hove’s recent City Achievers 2016 student awards ceremony. 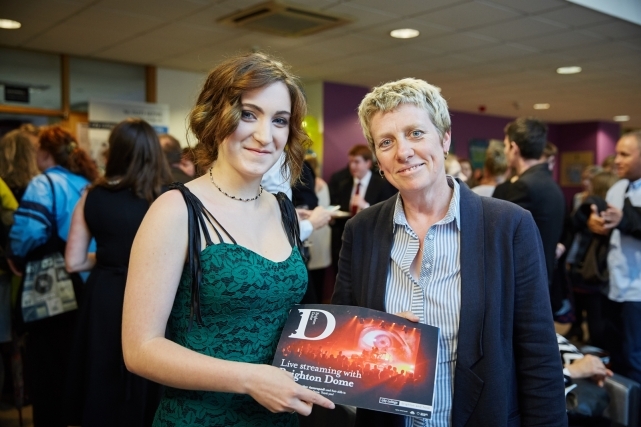 The award was given for working in partnership with the college to provide film-making students with excellent hands-on experience of live streaming some of Brighton Dome’s most high-profile shows, particularly during the Festival. Brighton Dome has been working with students from City College Brighton and Hove for the last four years, who have gained invaluable hands-on experience of working with state-of-the-art audio-visual equipment. The livestream selection has included high profile events such as Tim Crouch and Spymonkey’s re-enacting of every onstage death from the works of William Shakespeare in The Complete Deaths and the concert by Songlines Music Award winner Debashish Bhattacharya. Relive your favourite Brighton Festival 2016 events by watching the live streams here.